← Be Careful What You Pray Will Happen To Others. Still believe in the Left/Right paradigm? Do you need proof that there is no difference in the ultimate agenda of any modern political party and the mainstream media’s role as the 4th branch of our governmental structure? Look no further than the latest debacle with New Hampshire Representative Stella Tremblay! After Representative Tremblay appeared on the Pete Santilli Show, the amalgamation of the corrupt entities teamed up to demand her resignation, for simply daring to ask questions. 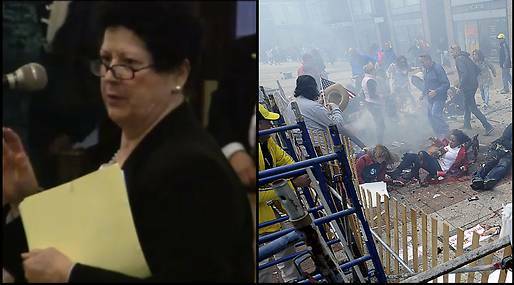 NH Rep. Stella Tremblay Receiving Death Threats After Publicly Calling For Investigation Of Boston Marathon Bombing Rep. Tremblay has obviously not formed her opinions and made her controversial remarks based on conspiracy theory. She has publicly stated that she watched a YouTube presentation by Former US Army LTC Roy Potter who she found to be credible and credentialed to discuss the high probability that the Boston Marathon bombing was a “Black Op”. Tremblay Questions Marathon Bomb Victim’s Injuries Note: This story was updated at 7:20 p.m. to include comments by House Republican Leader Gene Chandler, R-Bartlett. Arianna Huffington In 2011, AOL acquired The Huffington Post for US$315 million and made Huffington president and editor in chief of The Huffington Post Media Group, which included The Huffington Post and then-existing AOL properties such as Engadget, AOL Music, Patch Media, and StyleList. Contact Info HERE for Stella Tremblay. Posted on May 7, 2013, in Civil Rights, Uncategorized and tagged Boston Marathon Bombing, Stella Tremblay. Bookmark the permalink. Leave a comment.